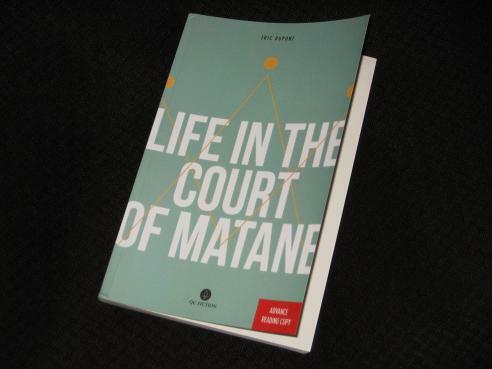 Life in the Court of Matane (translated by Peter McCambridge, review copy courtesy of QC Fiction) is writer Eric Dupont’s take on a large chunk of his formative years. After their parents’ marriage disintegrates, young Eric and his elder sister first stay with a horrendous foster family (a time which is mercifully skipped over in the preface) before being sent to live with their father, a police officer, and his new partner. This move to the town of Matane ushers in a new period in the young boy’s life in which he must come to terms with life under the rule of a couple who brook no opposition. While his childhood obviously wasn’t as happy as it might have been, Dupont chooses to distance himself from it somewhat rather than wallowing in misery, and one of the ways he achieves this is by transforming the ramshackle trailer he lives in into the more impressive sounding Court of Matane – with his father transformed into Henry VIII. As the young boy grows up under the watchful eye of Anne Boleyn, the ‘king’ rails against his own enemy – not the Vatican, but Canadian federalists -, leaving Eric to indulge in the creation of his own dream world, a far better one than the cold, provincial nest he’s been lumped with. However, on the whole Dupont uses a light, cheery tone, using humour to gloss over the distress of his family break-up. The original title of the novel was Bestiaire (Bestiary), as the six chapters and epilogue are each named after a different creature. These birds and animals are then featured in the section, either prominently, as is the case with ‘The Hens’, in which Eric receives a group of hens and starts to sell eggs (with the pecking order an allegory for schoolyard cruelty), or more tangentially. For example, in ‘The Brown-Headed Cowbird’, the featured bird only makes an unexpected appearance at the last second during a visit to his grandparents’ house. However, the new title is perhaps more apt, shifting the focus to the family unit at the centre of the novel. Although we do learn Eric’s mother’s name, for much of the novel she is simply Catherine of Aragon, a woman to be forgotten under the strict reign of her replacement (the first of many edicts in the Court of Matane is that there should be no mention of the mother’s name). Anne has the children’s best interests at heart, but later on cracks will appear in the court, with the King’s wandering eye settling on a new queen. He’s certainly a Quixotic character, raging against the forces of federalism, a tyrant cloaked in his fleur-de-lys flag. When that dream is finally crushed, his energies are diverted towards the idea of building a boat, allowing him to float away from the disappointment of not having an independent homeland. Much of the book, though, focuses on Eric himself, a shy, bookish boy marooned in an environment where his talents are unappreciated. Growing up, he mainly hopes to get away one day, so it’s little wonder that he frequently retreats into a dream world. The writer uses a style akin to magical realism in places, interacting with some of the animals who lend their name to the chapters. This includes lengthy conversations with a dog by the frozen sea-front and a nocturnal encounter with an owl who is to assist in the boy’s eventual flight from Matane. While there’s discomfort beneath the surface, it’s usually hidden behind a wry smile and some clever word-play. Nice review Tony. I am discovering some of the small Canadian presses for English language lit but by and large I prefer the Québéc literature, especially this newer generation. It’s been a nice revelation for me. We’ll have an excerpt in Numéro Cinq that I chose (I was just writing a brief intro for it in fact) along with my review. Going back to the book I found there were so many sections ideal for longer excerpts. Reblogged this on Literary Translation in Québec.